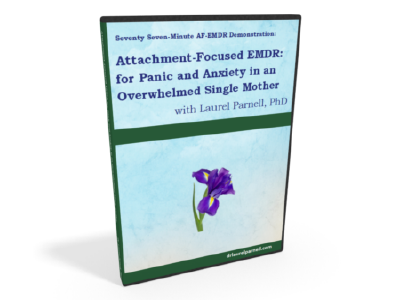 EMDR for Panic and Anxiety in an Overwhelmed Single Mother - Laurel Parnell, Ph.D. In this session, the client, a single mother of four children presents with a terror that her children will contract a “tummy bug”. She said she had intense fear, anxiety, and panic that could be triggered by anything that she believed might produce a stomach ailment in her children. She believed that her intense fear was an exaggerated response and wanted to be less anxious and reactive. 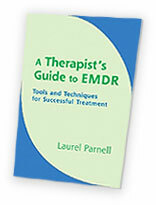 This case was complicated, multifaceted and had multiple contributors linked to her stress and anxiety that she was able to successfully process with EMDR in this session. We began by exploring the presenting problem, including any associated triggers, behaviors and history. We then developed and installed resources. We used the bridging technique to find the first target to process, bridging from a recent trigger for her panic. Several times during the session when the client returned to the target to check the work she discovered new emotionally charged channels that she then processed. From time to time we explored blocks and employed interweaves to unblock them. When the earliest target was processed and a positive cognition installed, we checked back with the triggering incident from which we had bridged. Finding that the trigger was no longer charged, she processed it with new feelings and beliefs, and then processed future potential triggers. 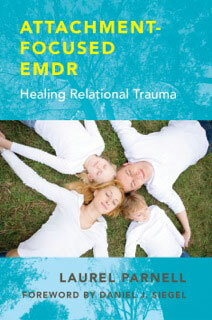 By the end of the session she felt relief, and a significant diminishment of her anxiety with regard to her children. She realized that there was a “normal” level of stress inherent in raising children on her own, with which she was more comfortable. This video includes an discussion of the case conceptualization and the use of the bridging technique as well as a questions from the class.